When you are in need of electrical services, you want to hire electricians that you can rely on. While many companies only care about the paycheck and rush through the project, not caring about safety, or even ensuring that the job is done right. This is simply not the case when you hire Mr. Sunshine’s Home Services. Quality is our specialty, so much so that if the job isn’t completed correctly, you don’t pay! We’ve been proudly helping the residents of Litchfield Park with their electrical needs for over 12 years now, and in that time, we’ve gained the trust of countless customers because of our commitment to getting the job done right, the first time. Continue reading to learn more about our electrical company and the services that we offer, and if you’re in need of reliable and experienced electricians, than don’t hesitate to give us a call today! We understand that there are multiple companies to choose from when requiring electrical services, and it can be difficult to decide which one you can trust. At Mr. Sunshine’s Home Services, we go above and beyond to make sure that we exceed the expectations of our customers. You never have to worry about our electrical technicians showing up late, or not getting the work done safely and efficiently. We are a local company and we care about our community and one of the ways that we make ourselves stand out from our competition is through honesty. We’ve heard a lot of horror stories over the years about unreliable electricians that provide shoddy work, and to make matters even worse, charge the client way more than was initially discussed. Not when you hire our technicians. We are completely transparent with our customers from the get-go and will not charge any hidden fees or keep you in the dark. You will always be updated on the work that is required, the timeline, and the cost. Our technicians are hand-selected based on their experience and work ethic and undergo complete background checks before they join the team, and our business is bonded, licensed, and fully insured so that you can have the peace of mind knowing that you chose the right company. We understand that having electricity in your home is a must, so if you’re currently in need of our electrical services but are worried that you’ll be unable to pay, we offer flexible financing options to help out. Whether you’re in need of new electrical installation or electrical repair, you can count on us to get the job done at an affordable price. When your electrical equipment needs repaired, this is not only an inconvenience but it can also be a safety hazard. Older fuse boxes and circuit panels can be a real danger for you and your family, so when you know that something is out of date, you want to get it taken care of immediately. Our technicians are incredibly well trained in all types of electrical repairs, including diagnostics and troubleshooting. When moving into a new home or undertaking a remodeling project you want to be sure that everything is up to code, functioning, and safe. Our electrical technicians in Litchfield Park can handle almost any electrical installation job. It can be frustrating when something goes wrong and a piece of your electrical equipment stops performing its job correctly. Obviously, you want it back up and running as soon as possible. Faulty wiring is nothing to be ignored. If you’ve noticed any warning signs such as electrical outlets that do not work, smoke coming from electrical devices, hot receptacles, or if your home is over 30 years old, you don’t want to hesitate to call our electrical technicians to have them diagnose the problem and get it fixed before a disaster like a house fire. Have you recently purchased an electric or hybrid vehicle? Well, you’re going to need an electric vehicle charger! Our professional electricians have you covered and will install your new charger. Looking to upgrade the interior lighting of your home? 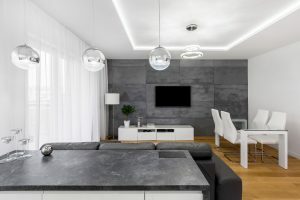 We have a variety of lighting options available for you and can help you decide on the lights that work best in your home, and get them installed. Making your landscape glow is a great way to secure your property, avoid tripping over objects at night, increase the value of your home, and also make the exterior of your home more comfortable and inviting. While this may seem like an easy task to do on your own, it’s not safe to DIY. Don’t risk playing with electricity and have our expert electricians install your ceiling fan. It’s incredibly important to have your home checked for any electrical problems that could put you and your family in danger. By having an electrical safety inspection, you can be sure that your home is safe from any wiring issues or other problems that could lead to a house fire. We are experts in all of the electrical services in Litchfield Park that we offer but have found that new electrical installation is the most common job that we do. Getting new electrical components installed into your home is not a task that should be taken lightly. If the job is rushed, or you hire inexperienced electricians, then you’ll likely experience problems almost immediately in your new home and are also putting you and your loved ones at risk. We know that it can be difficult trusting in contractors, but from the moment you meet the electricians that make up our team, you’ll quickly realize that your satisfaction is our ultimate goal, not the paycheck. No matter the size of the project, it is imperative that you ALWAYS hire a licensed electrician. We know that it can be tempting to try and save some money by doing the job on your own or hiring an unlicensed friend or neighbor, but your safety is more important than saving a few bucks. As we all know, electricity can be dangerous, and with so many components involved, one small mistake could be fatal. Even if it seems like an easy job, is it really worth it? Not only should you take your safety into consideration, but if you hire an unlicensed contractor, do you really think you’ll be saving that much money? 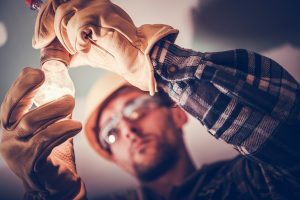 Not only will you not be sure that the work is done properly, but with someone lacking experience trying to do electrical work, it’s not likely that the job will be done correctly the first time around. When you hire the electricians at Mr. Sunshine’s Home Services, you can rest assured that we will be there when we say we will, we’ll be courteous and professional, and most importantly keep you safe and get the job done properly. Thankfully, going green has become very popular in recent times, and by taking a few simple steps, you’ll not only be able to save on your monthly energy costs but help the planet as well! Mr. Sunshine’s Home Services is proud to help the people of Litchfield Park take care of the environment through our electrical installation, repair, and other services. The following are a few ways that you can go green and start saving today! More and more people are beginning to see the many benefits that solar panels provide. By harvesting energy from the sun, your power will be generated from solar rays. One perk is that you will receive energy credit or even payment from the power company! Also, the dry and sunny climate of Arizona means that you will benefit from the solar panels almost immediately! One great way to go green and conserve energy is by utilizing light sensors. When the sun is out and shining, the sensors will detect this and won’t provide much artificial light. But when the sun sets or is covered by clouds, the light will be enhanced. If you have any further questions or would like our electricians to install some of these interior lights, then contact us now! One of the easiest ways to save money and energy is by going through your home and replacing any outdated light fixtures with new and improved energy-efficient LED lights. If you would like to ensure that all of your interior lighting is upgraded, simply get an energy audit. A professional will walk through your home inspecting your light fixtures, and will be able to provide you with the amount that needs to be replaced as well as the cost. As we all know, it gets pretty hot in Litchfield Park which causes us to rely on our HVAC systems to keep us cool. If you have an old HVAC system, it will be working double-time to maintain the temperature that you’re comfortable at. This wastes a lot of unnecessary energy and will certainly make your monthly energy bill costly. If you want a surefire way to reduce your energy usage, then upgrading your HVAC system is a must. Are your appliances ready to be retired? Technology has advanced rapidly in the last few years and with everyone becoming more environmentally friendly, most appliances are much more energy efficient. To be sure that you’re getting the best appliances, look for the Energy Star label and contact our electricians so that we can provide our electrical installation services. If you would like any more suggestions on how to be more energy-efficient and help the planet as well as your bank account, then don’t hesitate to contact our electrical company today! Electrical work can be complicated and incredibly dangerous. Not only is this true when the service is being performed, but if you don’t have a professional electrician getting the job done then you’ll likely have electrical problems down the road. Here at Mr. Sunshine’s Home Service, we guarantee that you won’t have to worry about this being a problem. We are very selective when it comes to the technicians that we hire because we know how important it is that you trust us in your home, and we also know that you want the peace of mind knowing that everything is done according to code and with no chance of hidden hazards or having to have us return to do more electrical work that should have been done the first time. We pride ourselves on being the most trustworthy and professional team of electricians serving Litchfield Park and the surrounding areas. We are trained extensively in all aspects of electrical services, certified, and dedicated to the ultimate customer service. Whether you’re looking for electrical installation, electrical repair, wiring, what have you, we are the ones you want to call. Don’t hesitate to contact our electrical company today to get quality electrical work at an affordable price.